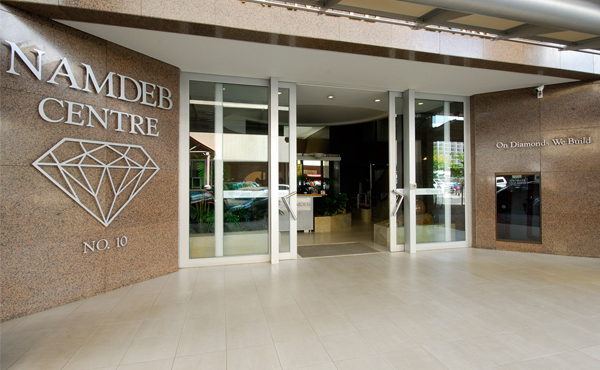 Namdeb is a wholly owned subsidiary of Namdeb Holdings (Proprietary) Limited Holdings which is owned in equal shares (50:50) by the Government of the Republic of Namibia and De Beers Group. Namdeb performs land-based prospecting (exploration), mining and rehabilitation operation and services for Namdeb Holdings. The heart of the operations is along the southwest coast of Namibia with land-based operations being centered around Oranjemund and additional activity taking place at satellite mines near Lüderitz as well as along the Orange River. Namdeb, the pride of Namibia's mining. We produce diamonds profitably, sustainably and responsibly to the benefit of our shareholders and other stakeholders whilst making a lasting contribution to Namibia. Safety is a key value and the number one priority for Namdeb. A zero harm approach forms the foundation of all aspects of operations and this care is extended to all stakeholders and the environment in which Namdeb operates. With a workforce of approximately 1 800, Namdeb continues to build its skills base. There remains a focused commitment to increase the number of female employees within an industry that is traditionally male-dominated. © 2019 Namdeb Diamond Corporation (Pty) Ltd. All Rights Reserved.